Hei hei, short post here on some great afternoon snacks to keep you awake. If you recall, I managed to fight for seats at Nyonya Colours few months back to sample their top-notch kuihs. This place used to be darn packed on weekends but the rave seems to have subsided recently. Char siew bao went for their cucur udang (RM1.50). Didn't get to try it cus Csb was in possession of the cucur. I bet they taste great too. You can tell from the way Csb gorged his fried shrimp batter. 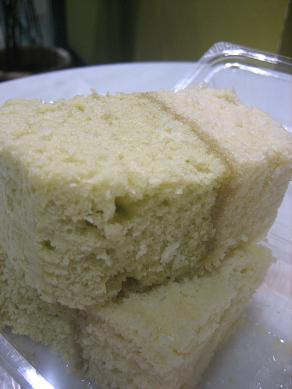 I grabbed a small box of steam sponge cake (gei dan gou), around RM2. This fluffy sponge cakes have always been my fave since my childhood time. Nyonya colours' version even has a layer of kaya sandwiched in between the pandan and the original flavoured sponge cakes.Ooo...I'm so in luv with this. 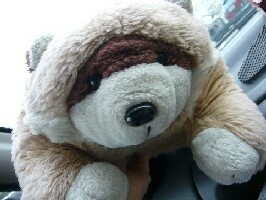 The greedy gluttons picked another 2 pieces of kuihs from the display case, price range from 80 cents to RM1 per piece. I can assure you that their kuih slices are the best in town, at least better than the kuihs sold in pasar malam. Very flavourful and and and....they are just so delicious. We had tapioca cake (left) and kuih getuk (right). The kuih getuk tasted interesting cus I never had this kind of kuihs before. I think it is made of mashed 'muk shue' (or 'wood sweet potato? I only know its cantonese name ;p) and topped with grated coconut. 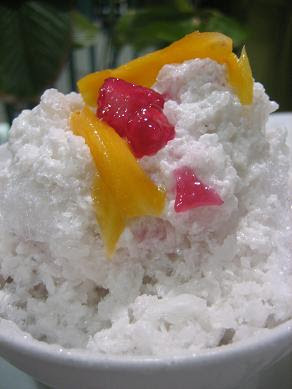 Not to forget my fave shaved ice dessert. This time round we had a bowl of Thai Red Ruby (RM3-4), the red rubies are actually water chestnut morsels with red colouring, drizzled with santan and topped with some sweet nangka slices...Ooo so heavenly refreshing. 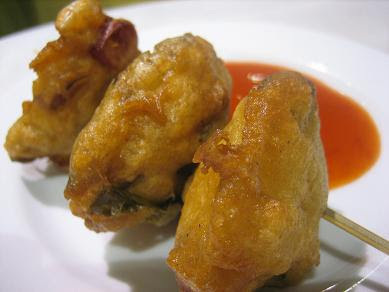 You have got to try this if you luv nyonya snacks. Hope I didn't spoil your diet plan. Aiya, who cares, they are good food man! joe: i duno how to delete partly leh. So delete your whole comment ah? Premium nyonya kuihs, no doubt. I've not been here tho. My weakness have alwasy been for the blue coloured ones eaten with a dab of kaya (aiya, the nama just won't come to me now). canot lar, kuih veli nice leh. must try! I luv curry puffs too, esp ikea's one. A lot of ppl = good stuff. I was attracted by the crowd on my first attempt to fight for seats. Nvrmind, u can still come back for the cakes. I tot mo mo cha cha is hot one? Or isit shaved ice dessert? Err..so this muk shue kuih is tapioca kuih then the left side one is wat kuih huh? Errr...that one ah, we actually call it 'blue kuih' in cantonese. But i recall that Flavours magazine named it as 'kuih hempit'. Nice nice...i luv that too with grated gula melaka coconut. hey watch it these kind of things can make u loose yr desire for other important things u know. 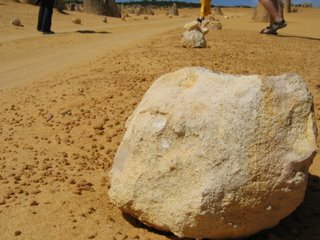 but never mind v are heading there with some people ( ok onot meiyeN / lianne ) for 24 hours to try all. u joining us onot xlb ? okok no problem..haha as usual the kuih looks decently good. whahah i have bad discipline when it comes to desert.. maybe it be Chinese cakes, kuih, english cakes... ahhahah kill the diet. eat first think later. I love Red Ruby dessert! Haven't tried the one here though...must! actually tapioca is muk shue rite..? huh...desire for wat other things??? so the bck street gluttons are moving to the main street now? Of cus no prob lar, keep intact via msianfloggersgroup. meatball from ikea ah? not 'halal' for me..haha...I pantang beef but i do like to dine @ Ikea's cafeteria. joe ;p so did u rcv my email finally? yup, agree dat the red water chestnut morsels are interesting, a good try! I didnt know that momo chacha got shaved ice version. Normally my mum diced some yam and sweet potatoes and chuck into a pot of santan water...is this momo chacha? wat lar, this is an overdue post i swear! I so cham, long time nvr eat out liao...ooohooo....tonite gonna cook on my own too. oh u pantang beef the no choice lo~ :P, i wonder if they got other variety meat. Yes, pulut taitai. Thx jian. My mom used to make gai dan kou for my dad's birthday cos he loves it and ask us to beat the eggs. But minus the kaya layer lah. I absolutely love RED RUBY DESSERT! Another gud snack i can think of is Roti Jala! Dipped in hot & spicy curry! Yummmyy! You sure not? 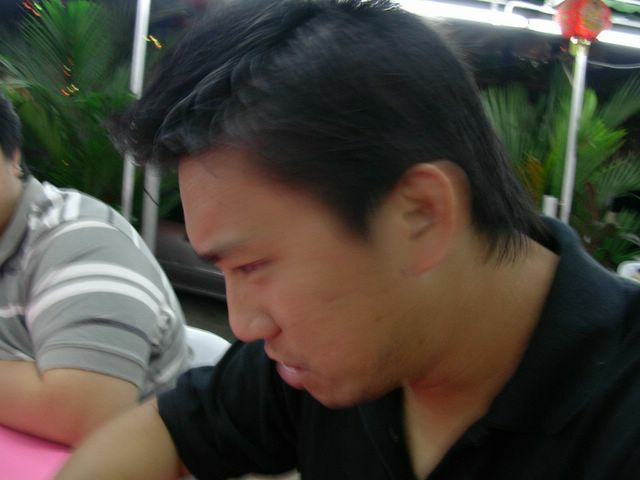 :P Everyday eat out also "sien" mah. Sometimes, cook on your own also not bad. That's why we have "Wok With Kok" mah. haha! Poonky: No they only have beef meatball, hard to chicen meat ball in rest. tummythoz: errrr.... i nvr knew that it was called pulut tatai. 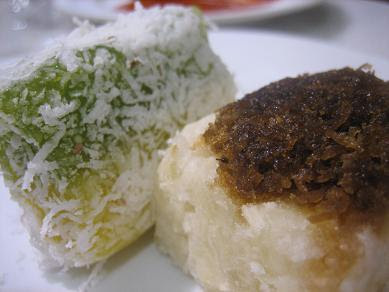 jian: Penang also got kuih. Go buy urself some now :) Hor? Bubur n momo are different? Dun think KL has the shaved ice version. Kok: Yalor, feel a bit sien now cuz eatin out quite alot. Outside food are usually oily n salty. Home cooked food is the best, but washin d dishes is dreadful. KL dun have? lolz the chestnut morsel dessert is the same as mo mo cha cha la...just different stuff in the dessert oni. Imagine momo cha cha got kidney beans,sweet potato, yam, big sago balls and atap chi in raw santan sweetened with white sugar syrup. I also pening with the term lar...haha will buy when i see the indian seller. Oh yah, another thing is, most of the time I buy nyonya kuih from indian seller. Nicer wor. i think nyonya kuih is abit different from malay kuih, i prefer nyonya's. hei...i duno indian sells kuihs oso??? U mean vadai n those sweet indian snacks? 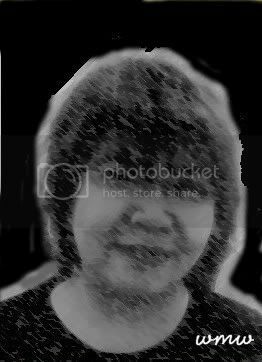 Fellas, my name is Yong and I want to invite you all to come down to Melaka. We make a different type of pineapple tart, its pie style and our pineapple are chopped and not grated. So you will have that chunky feel when your teeth sink into the pie and the pastry is something else. Call us at 0196666966 Yong 2 days before you come down to Melaka and we will let you try it. Currently we are operating from home to cater to just regulars and we are going into production soon.